My favorite go to tool for over 45 years now is my fencing tool. I used it fairly frequently in northern & central Nevada repairing downed/damaged fence line. But it came in handy for so much more. 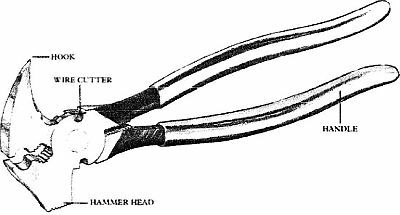 It is a hammer, pincers, pliers, wire-cutters, crimping tool, nail puller, awl, mini pryer, and pretty much what I needed when I needed it. I was really lost without it when the tool had been misplaced, so I bought similar fencing tool. True to the old adage, if you can't find something, get a replacement and the original will show up. It worked, and now there is one in the trailer and one in my rig. Comments for My Favorite "Ultimate Multi-Purpose Tool".